Thousands of school children from across the UK will take to their streets today to raise awareness of the 39 children who are killed or injured on roads in England every day. Brake’s Kids Walk, in partnership with Co-op Insurance, is a national project calling for key measures to make roads safer, so that more children can enjoy the benefits of walking. 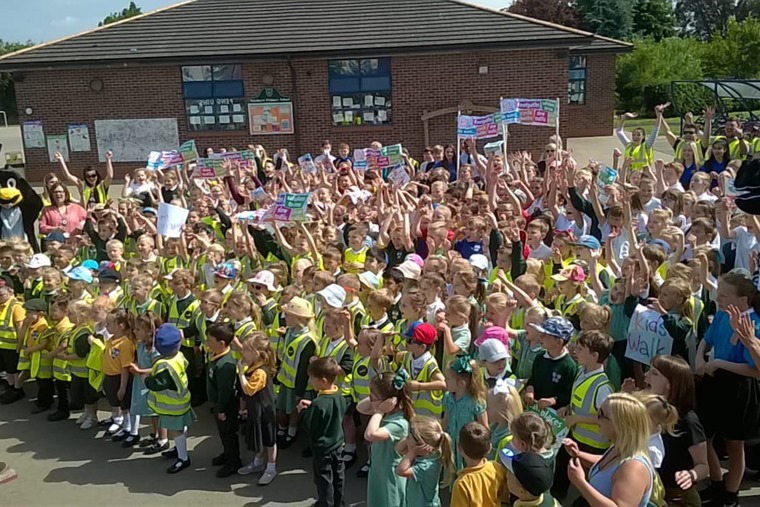 More than 100,000 children from more than 500 schools and nurseries are taking part in Brake’s Kids Walk, calling for five key measures to help keep them safe including more footpaths, cycle paths, safe places to cross, slow traffic and clean traffic. Short, supervised walks organised by schools will see children walk in a crocodile formation and hold hands to highlight the importance of being able to walk without fear or threat from traffic. Among those taking part are 450 pupils from Carr Hill Primary School in Retford, Nottinghamshire. The school is running a week of road safety activities in memory of pupil Seth Bartle, 10, who died after he was hit by a car outside the school in January. Latest Department for Transport (DfT) figures show that 14,273 children were killed or injured on roads in England in 2016. On average, 39 children die or suffer injuries as a result of road crashes every single day. That’s the equivalent of a classroom full every day.